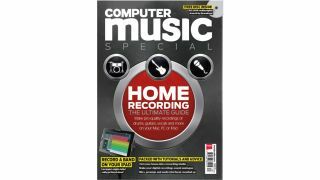 Computer Music Special: The Ultimate Guide to Home Recording – on sale now! There are few things as satisfying in music production as successfully recording skilled musicians playing real instruments. Sure, we love and are endlessly amazed by the awesome sounds and mind-boggling capabilities of our virtual synths and samplers, but the sense of achievement earned through such comparatively old-school endeavours as multitracking a drum kit, capturing a spine-tingling vocal or nabbing a perfectly executed guitar solo is rewarding on a whole other level. With this Special, we hope to both inspire you to get recording and give you all the knowledge you need to do a great job of it. Whether you're an electronic producer looking to take your sound in a more organic direction, a singer-songwriter yet to discover how easy it can be to commit your creations to hard disk, or a band member with designs on taking control of your act's studio direction, you'll find Home Recording - The Ultimate Guide an invaluable companion on the journey. And if you've been labouring under the misapprehension that getting into recording means investing thousands of pounds in microphones, preamps and hardware mixing facilities, then labour no more. All you need to get started is a sub-£100 mic, your Mac or PC, a DAW or audio editor/recorder application and the advice that awaits you in the pages of this magazine.